The Samsung Galaxy Tab 3 Lite is one of the most affordable brand name tablets out there but does affordable mean good value for the money? On the positive side, the small, 7-inch Android tablet offers the reassuring Samsung logo (it’s not made by an unknown white-box company), and the neat, well optimized for tablets TouchWiz user interface. However, even though the Galaxy Tab 3 Lite does not have any tragic flaws, it simply cannot flex much performance muscle. 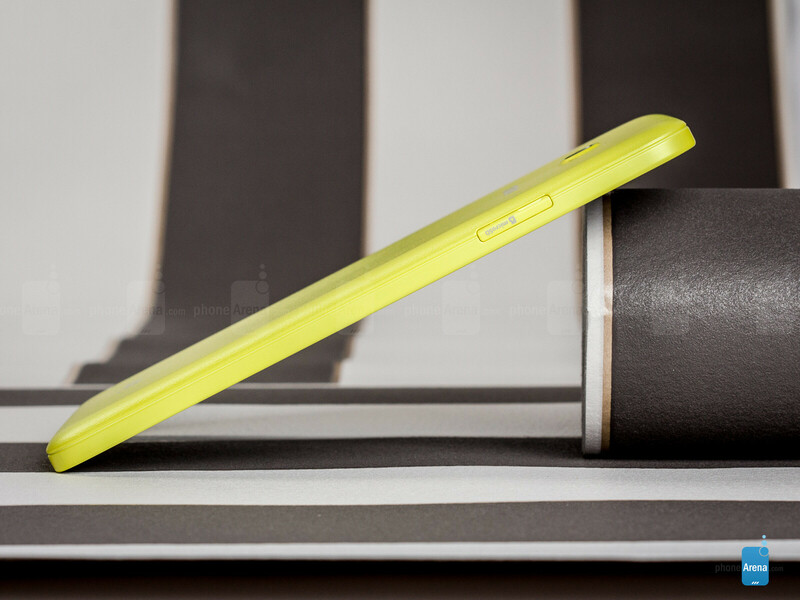 It’s got a basic dual-core processor, a low-resolution display and a barebones 2-megapixel camera. How does that all work out in real life, and can it compare to some extremely affordable, yet superior technologically Android tablets? 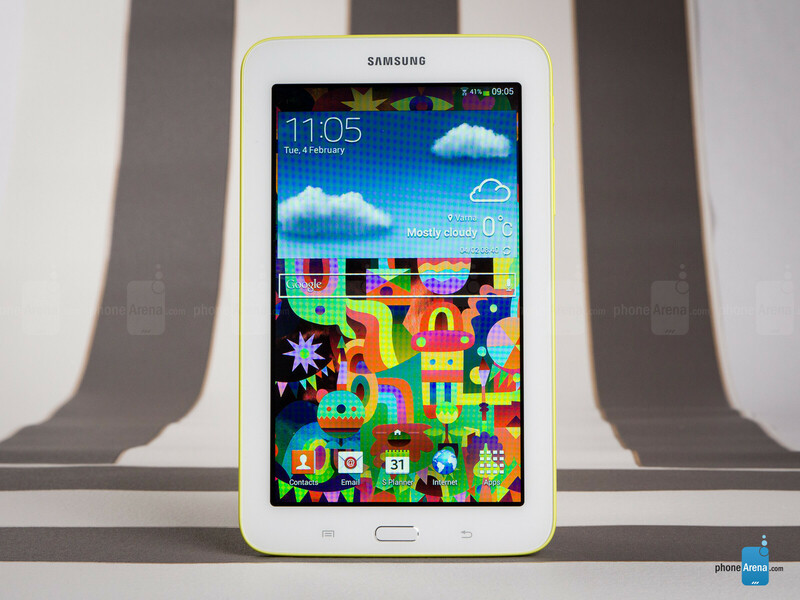 We have tested a pre-production unit of the Galaxy Tab 3 Lite that gives us a good idea of what we can expect - take a look. 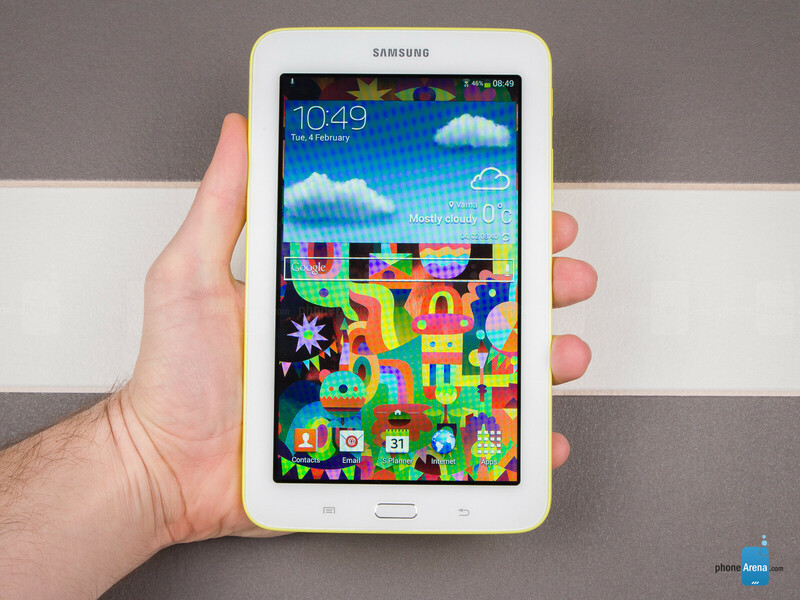 The Tab 3 Lite features narrow screen bezels that make it compact and easier to hold; it’s chubby, but also lightweight. An apple does not fall far from the tree - this saying should summarize well the typical Samsung look and the design of the Galaxy Tab 3 Lite. This tablet is the spiritual successor to the Galaxy Tab 3 7.0, and has not only very similar hardware, but nearly identical visuals with it. Yes, that means it is all plastic. 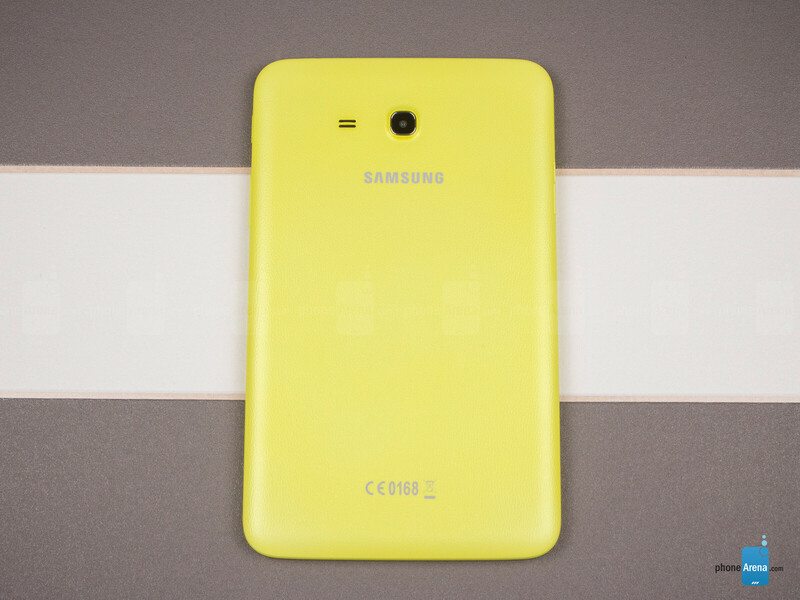 Our pre-production test unit comes with a lemon yellow textured plastic back, similar to the faux-leather one of the Galaxy Note 3, but it seems like what we have is a more limited edition of the tablet, and the generic one could feature only black or white colors, and come with a glossy finish. In terms of size, it is compact overall, with fairly thin bezel , but a bit chubby measuring a considerable 0.38 inches (9.7mm). Luckily, it is also fairly lightweight at just 0.68 pounds (310 g), so you can easily hold it for longer periods of time. We don’t want to draw any final conclusions, but the physical buttons on our test device come with a nice travel and clickiness, and are easy to press. 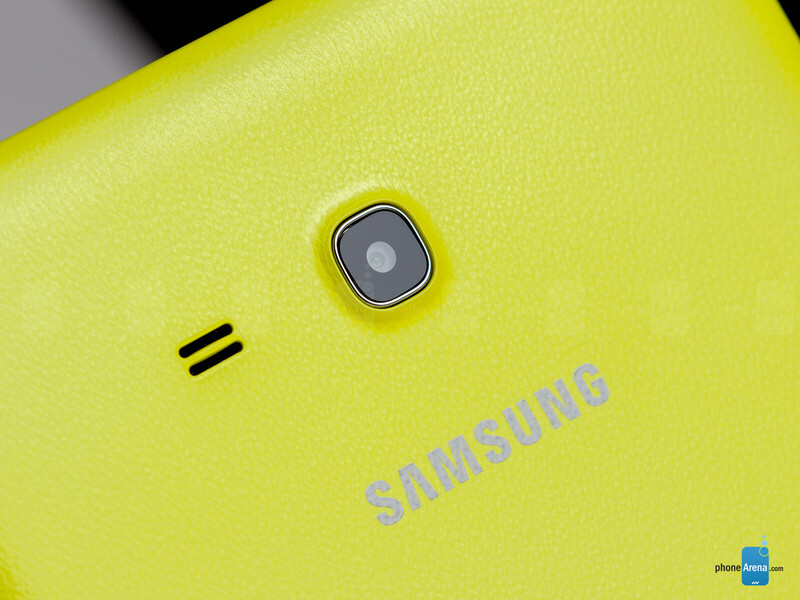 On the right side there are a lock key and volume rocker, and on the left is microSD card slot. 170ppi just fails to meet modern day expectations for sharpness. The Galaxy Tab 3 Lite features a very modest 1024 x 600-pixel 7-inch display that just fails to meet modern day expectations for tablet sharpness. Pixel density comes in at around 170ppi, so you’ll definitely have trouble reading tiny fonts without zooming in. One feature that is annoyingly missing on the Tab 3 Lite is an ambient light sensor, so you’ll have to manually adjust screen brightness every time your light conditions change. There're definitely better offerings for this segment. I'd say that would be wiser to invest to previous gen (or current) Nexus 7. Display won't make headache and power advantage is huge (I mean insane). Told y'all samsung floods the market for no reason at all. To many android tablets out there from cheap to expensive. They all do the same just with different features. By far I use to hate on Microsoft but the surface pro 2 is a killer tab that has no major competition. Except the iPad Air, iPad Mini w/ Retina, Note 10.1 (2014) and Nexus 7 (2013). Agreed. Surface 2 Pro is good for productivity, though. do you really compare ios with windows? seriously?!! seriously man?! I said before and I'll say it again, this is a waste of money while the Tab 3 is available. You get the same thing with a better rear facing camera, an actual front facing camera, and an ambient sensor. I bought the Samsung Galaxy Tab3 Lite, and I enjoy it a lot. I bought it to play games from google play. Ive purchased and downloaded high end games, and my Tab3 runs them beautifully. For $150 this Tablet is worth it, the camera isnt very good but I didnt buy it for that. If you do have to much running the system will over heat. Ive only had that problem once, and I was running a lot of apps and widgets. The picture is good, I watch movies and TV on it. I would recommend this. Im in Computer Programming, Graphics Design, and E-Commerce, I know my technology.